77406 ENT AUSTRIA (1898) Bicycles. Uprated 3 kr postal card (O) to Sweden with printed form on back from Joh. Puch & Comp Styria Bicycle Works. 77410 ENT BAVARIA (1899) Passau bicycle club. 3 pf postal card (N) with printed announcement on reverse for committee meeting. 77411 ENT BAVARIA (1906) German bicycle touring club. 3 pf (on 2pf) postal card (N) with printed announcement on reverse inviting membership. 77407 ENT BELGIAN CONGO (1923) Bicycle*. 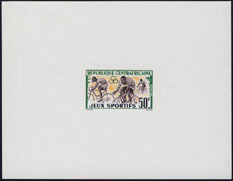 30 centimes postal card (N) with photographic illustration of trading post. 77415 LOC SWITZERLAND (1939) Bicycle military unit. Feldpost envelope with cancelation and military post stamp of Radfahrer KP 34. 77424 LOC SWITZERLAND (1939) Bicycle military unit. Feldpost envelope with cancelation of Radfahrer KP 1/5. 74173 OBL JAPAN (1950) Cyclists*. Illustrated cancellation on postal card. 77414 EMA GERMANY (1951) Bicycle parts. Red meter cancel on envelope: Schurhoff & Co. Fahhrad und Metallworke. Fahrradrahmen sind Deutsche Wertarbeit. 77416 OBL EAST GERMANY (1954) Cyclist*. Postcard with illustrated cancel for 7th International Freedom Ride. Warsaw-Berlin-Prague. 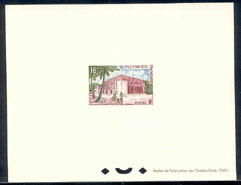 31520 EL FRENCH POLYNESIA (1960) Post office*. Bicycles*. Deluxe sheet. Scott No 195, Yvert No 14. 77418 OBL GERMANY (1961) Cyclist*. 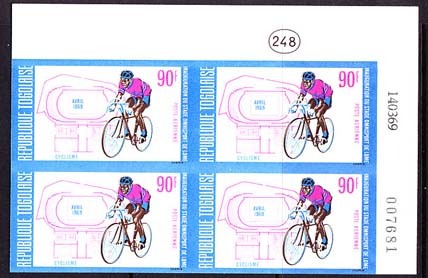 Illustrated cancel on envelope for 6-day race in Grugahalle (indoor arena near Essen). 77419 ENT RUSSIA (1961) Cyclists racing*. 4 kop entire (N) with corner illustration of Tula Velotrack (oldest in Russia). 77405 ENT RUSSIA (1962) Schoolchildren on bicycles*. 3 kop postal card (N) with photo on reverse. 58742 EL CENTRAL AFRICA (1962) Cyclists*. Deluxe sheet. Abidjan Games. Scott No 20, Yvert No 20. 77413 OBL EAST GERMANY (1967) Cyclist racing. Illustrated cancel on postcard for Waltershausen Rennreifen con Weltruf. 77417 ENT RUSSIA (1968) Cyclists racing*. 6 kop entire (N) with corner illustration. 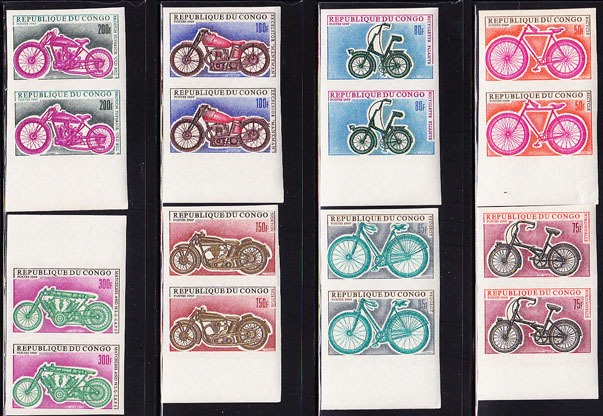 60400 ND CONGO (1969) Bicycles & Motos*. Complete set of 8 imperforate pairs. Scott Nos 183-90, Yvert Nos 229-36. 70604 ND TOGO (1969) Cycling*. Imperforate corner bl/4. Opening of Omnisport Stadium. Scott No C106, Yvert No PA108. 77422 ENT GERMANY (1970) Cyclists on the streets of Wetzlar*. 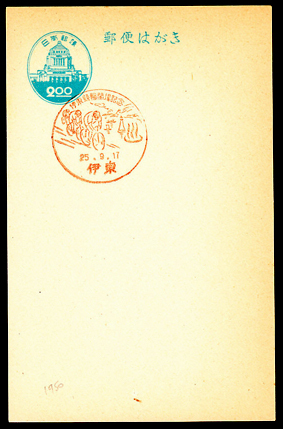 20 pf postal card (N) with corner illustration. 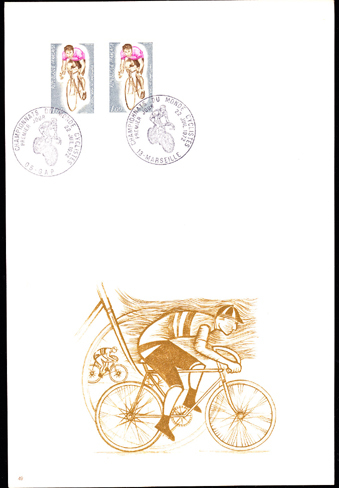 67286 FDC FRANCE (1972) Cyclist*. Philatelic First Day document with special engraving thematically related to the stamp and printed description and explanation of the stamp on the reverse. 1972 World Championship. Scott No 1350, Yvert No 1724. Hard to find! 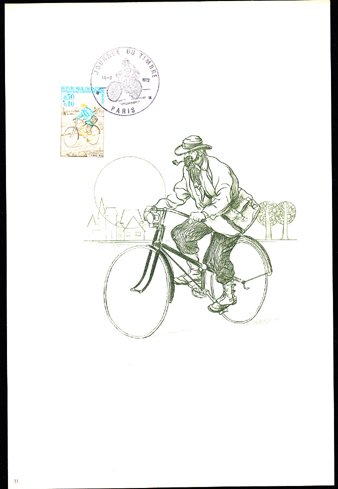 67267 FDC FRANCE (1972) Postal carrier smoking pipe* on bicycle*. Philatelic First Day document with special engraving thematically related to the stamp and printed description and explanation of the stamp on the reverse. Scott No B460, Yvert No 1710.